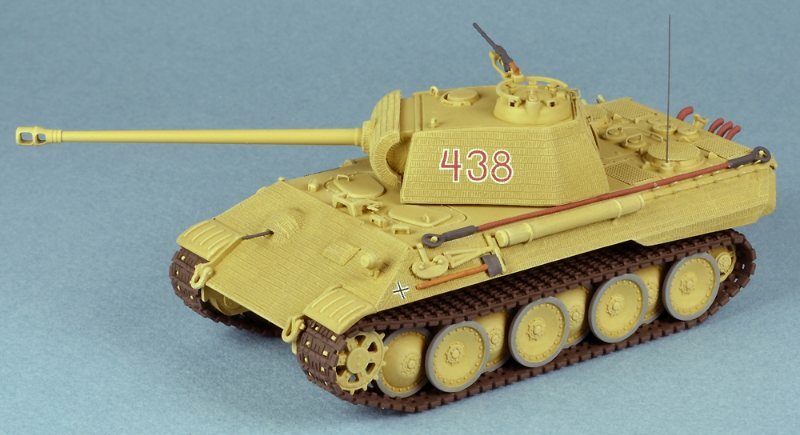 In 1/72 scale, there are hundreds of kits available of tanks, self-propelled artillery, armored cars, trucks, etc. Some of the ones I've built (the better ones) are illustrated on the AFVs sub-page of the ARMOR page of this website. 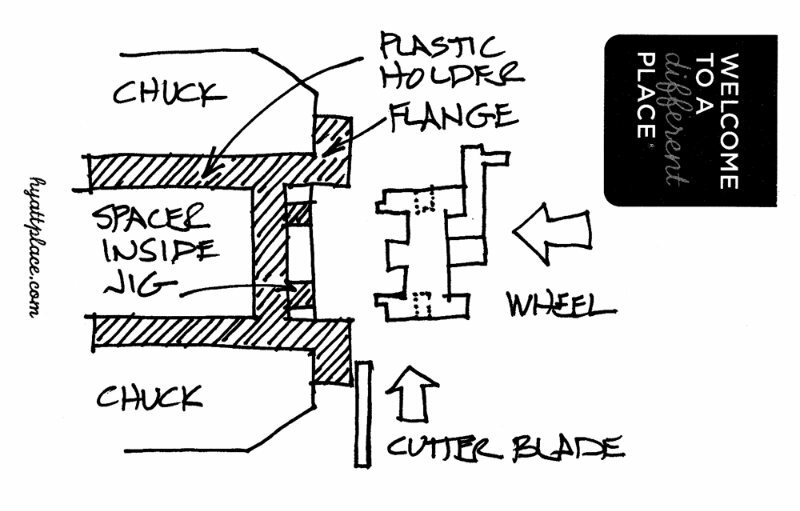 This sub-page in Building Models will illustrate some of the techniques I've used to build AFV models. I hope you may find some of these techniques interesting or even useful to you. 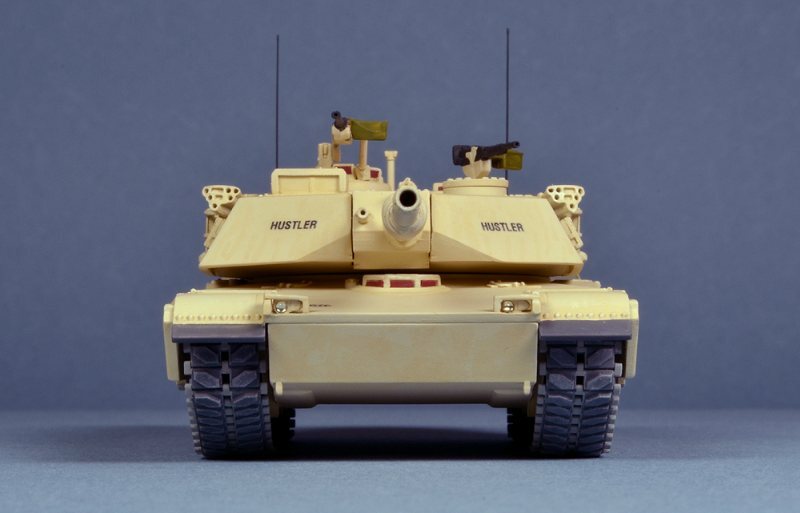 In about 1985, the Italian plastic model manufacture ESCI produced many new 1/72 scale kits of modern AFVs (Abrams, Leopard, M48, M60, M113, Merkava, T62) to join their existing line of mostly World War II armor. It was very exciting to have access to these previously unavailable subjects, but these new kits had interesting issues of accuracy. 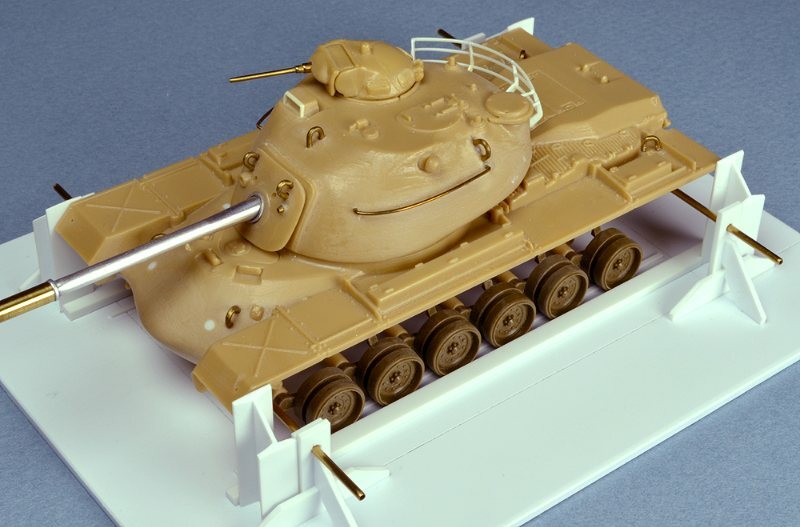 These models had molded styrene link-and-length tracks, which were a great improvement over the fat, crude, rubber-band-like vinyl tracks from before, but presumably to save on mold costs, ESCI usually took the short cut of molding the typical AFV road wheel pair as a single unit. 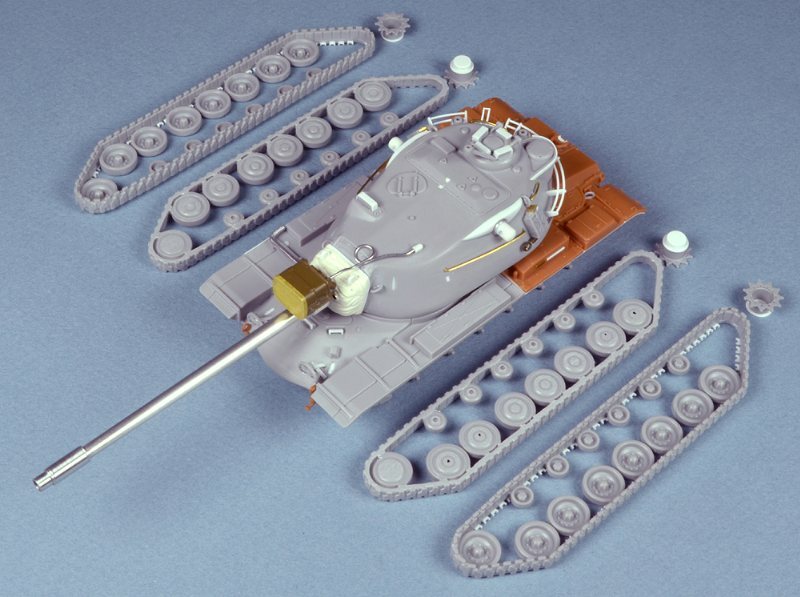 See the scan of the instructions from the Italeri reissue of the ESCI M48 kit below, as an example. To make these single road wheel castings look more accurate, you had to create at least the illusion of a separation between the two wheels. One technique was to file a groove down the middle of the circumference of the wheel. This is what I did on the ESCI T-62 and the ESCI Merkava. Another approach was to laboriously saw each road wheel completely in half. This is what I did on the ESCI M48 and M60 series of tanks, as can be seen in the ESCI M60 Starship model, below. ESCI M60 Starship kit with bogies sawn in half and spacers added to represent more accurate wheels. 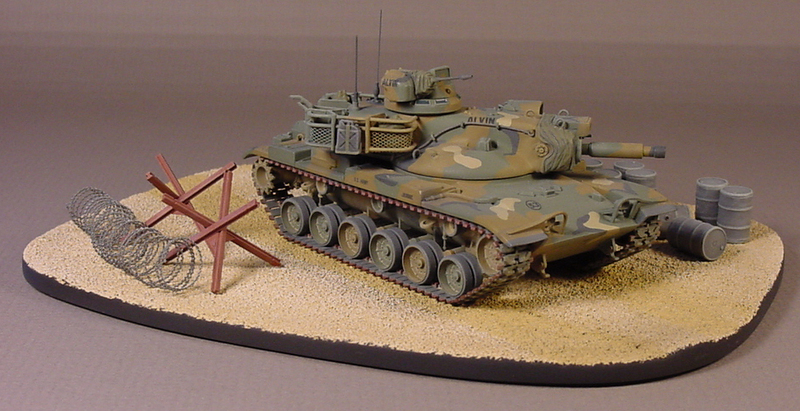 Years ago, after building three ESCI AFV models (M60 Blazer, M60 Starship, scratch conversion M247 Sgt. York), plus a scratch built MBT70, using ESCI M48 and M60 road wheels I had sawed into pairs, I started a fourth ESCI kit, the M48 Patton. I did a lot of work on the M48, including sawing in half a full set of road wheels. Somehow, though, I lost interest in the project. Later, when I started scratch building an M55 SPG, I robbed the M48 of its reworked road wheels set. This really put the M48 on a back burner. After bisecting more than 60 road wheels (there were some malfunctions), I couldn't bring myself to saw one more set of ten road wheels in two. Sketch of proposed collet to secure Italeri (ex-ESCI) M48 road wheel in Sherline lathe to machine a slot simulating separate road wheels. 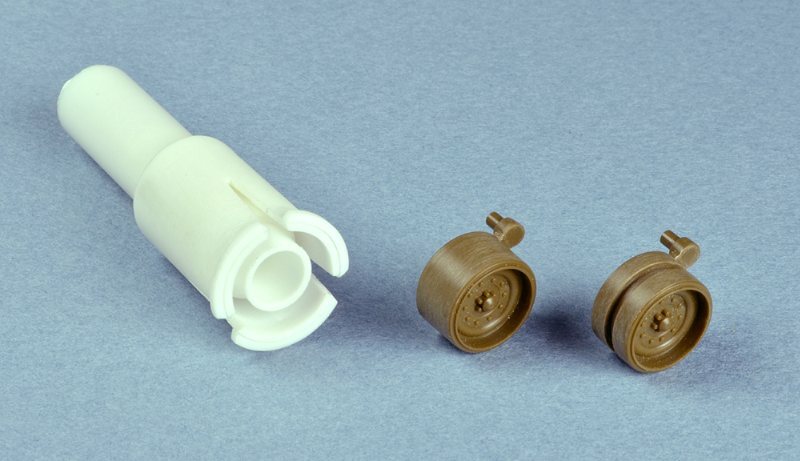 (Left) Custom collet made of Evergreen plastic, with (middle) unaltered Italeri (ex-ESCI) reissue double-width road wheel and (right) machined wheel simulating two separate road wheels. 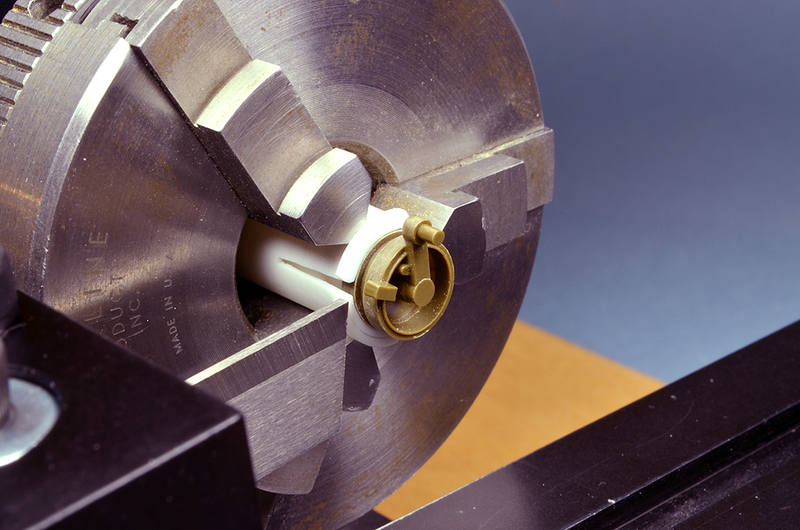 The flange on the outside face of the collet limits the depth to which the collet can fit in the lathe. A core inside the collet limits the depth to which the Italeri road wheel can be inserted. 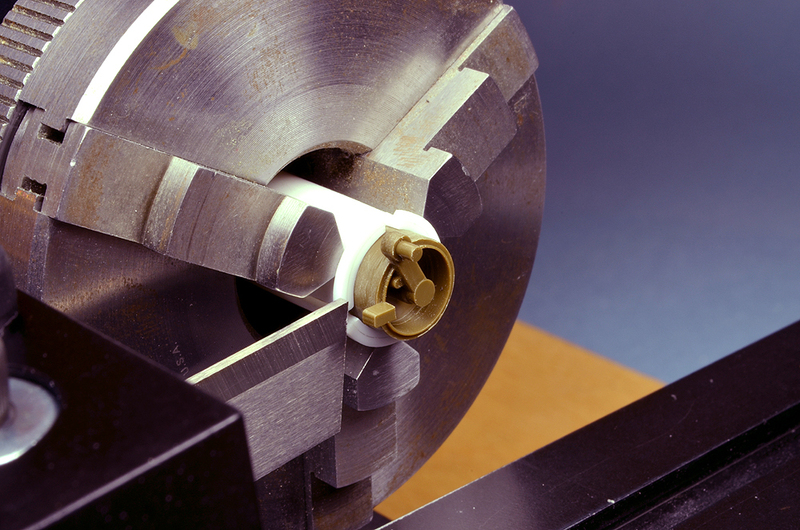 With the collet installed in the Sherline lathe, each Italeri road wheel was clamped securely, then turned at low speed. A cut-off tool was used to make a rectangular groove in the circumference of the wheel. I stopped cutting the groove into each wheel as soon as the plastic became paper thin, before I cut all the way through the wheel. The best I could reasonably achieve here was the illusion of two separate road wheels. Italeri (ex-ESCI) M48 road wheel inside custom Evergreen collet, in Sherline lathe. Italeri (ex-ESCI) M48 road wheel after machining in the Sherline lathe. Seeing these pictures, I realize I need to remove the rust from my lathe, with some steel wool and machine oil. Also, since posting these images on this page, I became aware of a source (Model-Miniature.com) of cast resin corrected M48 road wheels and M48 tracks. I have ordered two sets of each. We'll see if this solves the ESCI/Italeri/Revell of Germany M48 road wheel challenge. One of the critical issues of building AFV models is getting the road wheels to align properly. 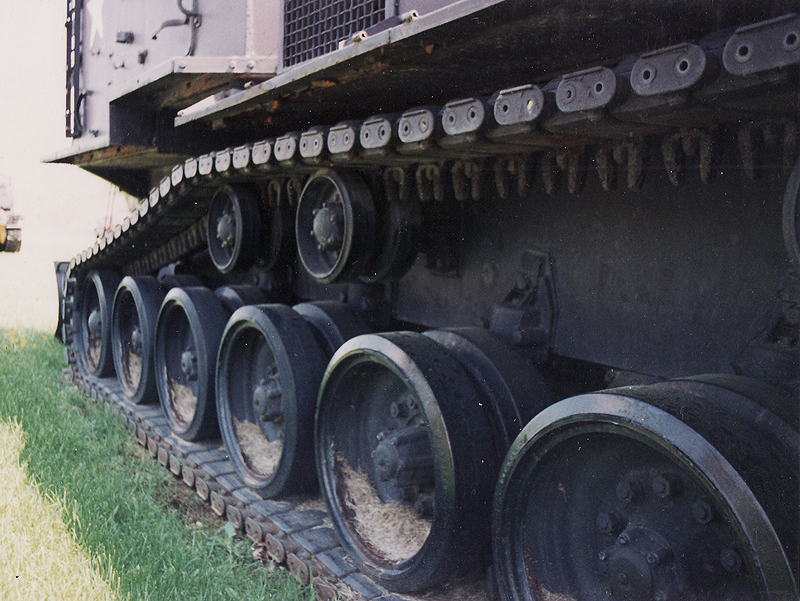 On real tanks, the road wheels move up and down through some sort of pivot to adjust to variations in the terrain, but the wheels always remain aligned with each other, in the same plane. 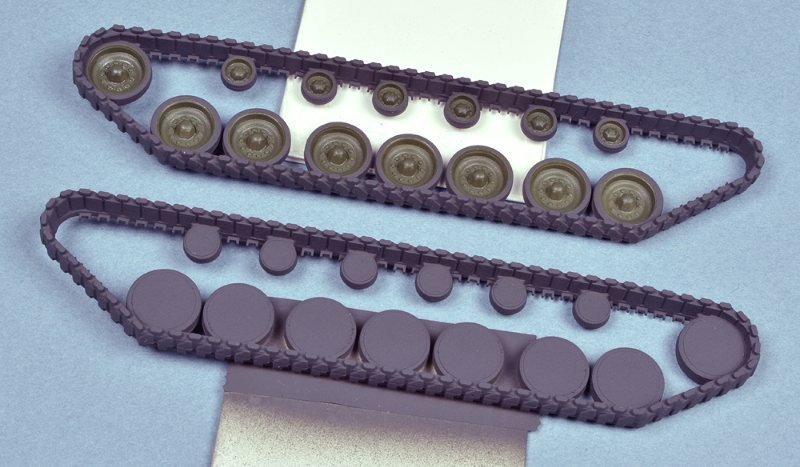 On model kits of AFVs, sometimes the join between the hull and the road wheels is poorly engineered, resulting in wobbly-looking wheels. One solution to this challenge is to build some sort of jig to align the road wheels while the glue sets. Below is a picture of a jig I built for a Pegasus M46 Patton (which, incidentally, came with accurate, separate twin road wheels). On the Pegasus M46, the torsion arms were well-engineered, with positive stops that aligned the arms, which could be glued to the hull with very good precision. I could rely on the torsion arms and road wheels to support the hull while the glue dried on the wheel-to-axle join, as long as the strips of Evergreen plastic corralled the road wheels, properly aligned with each other. The rubber band applied gentle pressure to coax all of the road wheels down flat on to the jig. With the ESCI M48, for some reason as manufactured the torsion arms were free to pivot in the sockets in the hull, so this jig uses supports at the four corners of the model to suspend the hull at the proper height, parallel to the jig base, on brass tubes through the axles of the drive sprockets at the rear and the return idlers at the front. This left the Italeri (reissue of the ESCI) M48 torsion arms free to swivel and hang down to the base surface of the jig, all at the same height. The Evergreen strips on the jig base aligned the road wheels in the same plane with each other. To see another jig I used to align road wheels on a Revell of Germany Panther A, click HERE. Scroll down past the Atomic Cannon and the IS-III to the start of the Panther A model. To fit the ESCI track around the drive sprocket at the rear and the return idler wheel at the front of the M48, I gently bent the ESCI track around the cylindrical handle of a scribing tool. Next (using Testor's Liquid Plastic Cement in very small applications with a small paint brush), I carefully glued a similarly-rolled piece of 10 thou (.010") thick x 25 thou (.250") wide strip of Evergreen styrene to the inside surface of the curved ESCI track. Once the glue dried, the bond between the two curved parts made the curl in the track permanent. 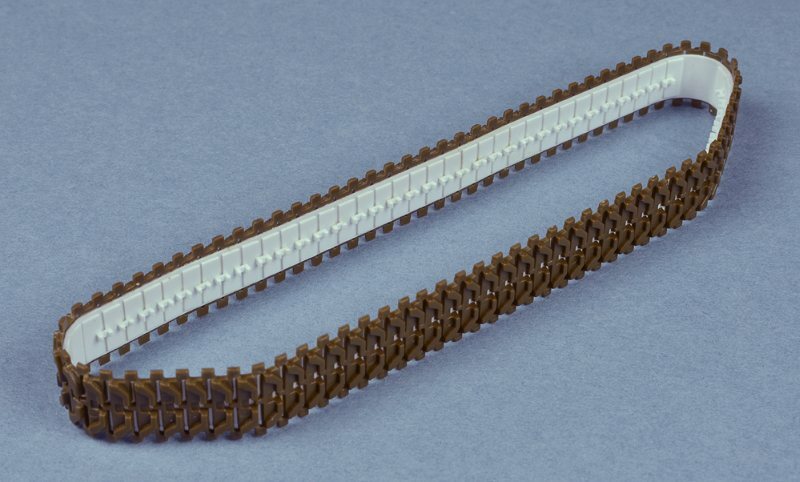 I alternated lengths of the ESCI track with lengths of the Evergreen strip, never letting both the end of the ESCI track and the end of the Evergreen strip coincide. That way, I always had an overlapping splice of one or the other to strengthen the assembly. As I added to the track, I checked the fit of the track around the sprocket, road wheels and return idler wheel. 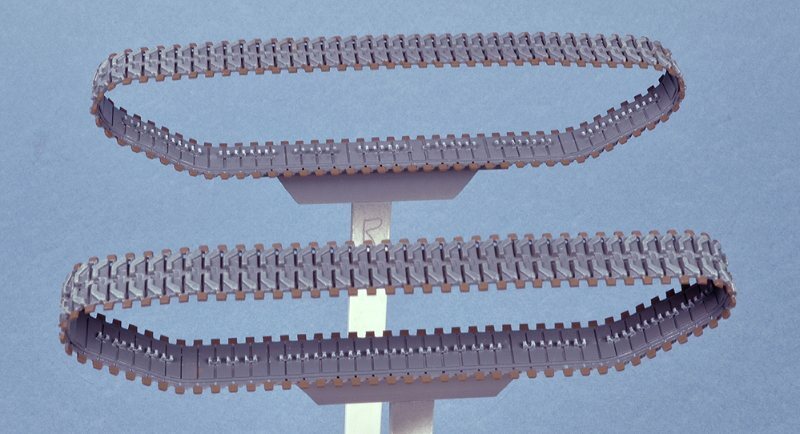 Eventually, I got to where one more piece of ESCI track, cut to the correct number of complete track links, would close the loop around all of the wheels. I anticipated that I had to leave enough play in the loop to allow for the next pieces I added to the track. While the completed loops were drying, I used a NorthWest Short Line "Chopper" cutting tool to cut about two hundred identical lengths of Evergreen 10 thou x 80 thou strip, to simulate the rubber tread blocks on the inside of the track. 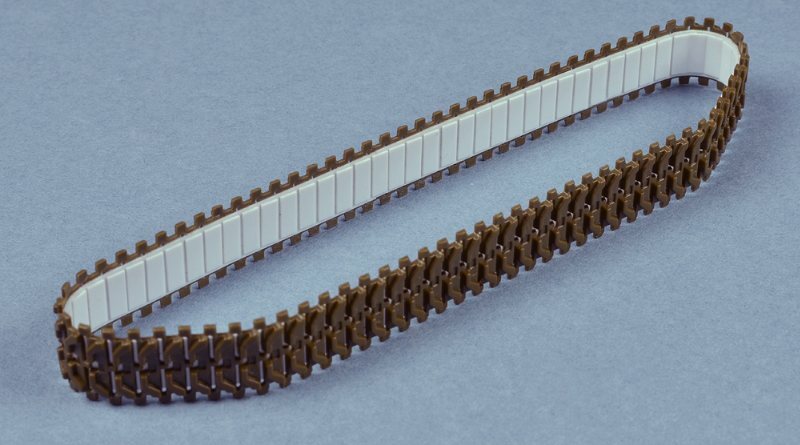 I glued these pieces to the face of the Evergreen strip already installed on the ESCI tracks, being as careful as I could to space these pieces equally around the track, leaving a uniform gap between each rubber block. However, I had to bunch them together at the tight turns around the drive sprockets and the return idlers. The last step in improving the ESCI track parts involved cutting and gluing about two hundred tiny slices of Plastruct styrene C-channel bits (to suggest the guide horns) at the joint between every pair of track links. The proportions of the available Plastruct C-channel stock are not very close to the actual proportions of the real guide teeth, but close enough. I cut these tiny bits by eye with a fresh No.11 X-Acto blade, because the pieces would be too small to cut effectively in the NorthWest Shore Line "Chopper". 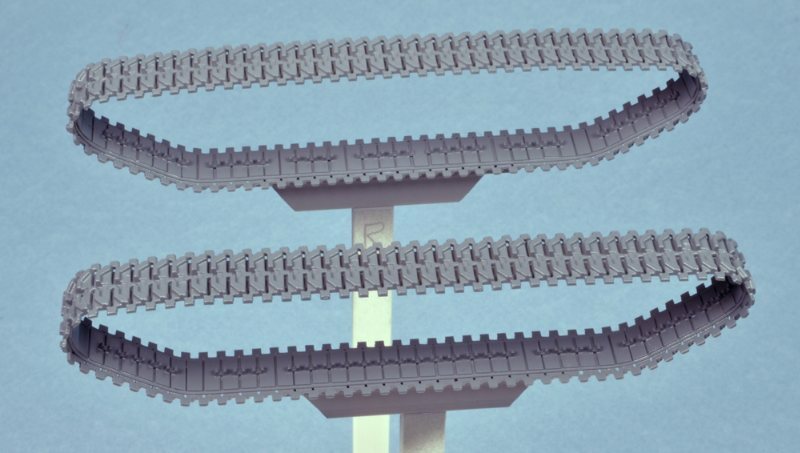 View of bottom run of M48 track with guide teeth left off or trimmed to make installing completed track fit past road wheels. Wheels will hide missing guide teeth. Dry fit of assembled tracks on tank. Tight fit at drive sprocket will happen during final gluing. I left off or trimmed as required the guide teeth that would be concealed inside the road wheels, but might otherwise impair installing the tracks onto the tank. Next came painting the tracks, before I installed them on to the model. To paint the rubber part of the tracks, I airbrushed Humbrol No. 27 Matt Sea Grey over the entire track loop. To simulate the rusted lugs connecting link to link, I hand painted thinned Humbrol No. 170 Matt Brown Bess. To simulate the burnished metal guide teeth worn bare by the road wheels, I dry brushed Humbrol No. 147 Matt Light Grey. Lastly, to bring out and emphasize the rubber cleats on the outside of the track loop, I drybrushed Humbrol No. 64 Matt Light Grey (confusing nomenclature, huh?). I'm really going to have to eat my own words in the "Weathering" paragraph of the "Opinions" sub-page of the "Building Models" tab on this website. Tracks painted and glossed, ready for drybrushing. Most typical AFV kits have road wheels and tracks that are separate (like the ESCI/Italeri M48 above), that can be individually painted and then assembled. On models like this, the boundaries between track and tire, and between the tire and wheel, are relatively easy to paint, particularly when the wheels can be mounted on toothpicks, and gently rotated between thumb and forefinger while applying tire-colored paint. Dragon kit of M103A2 with two-piece track assemblies. 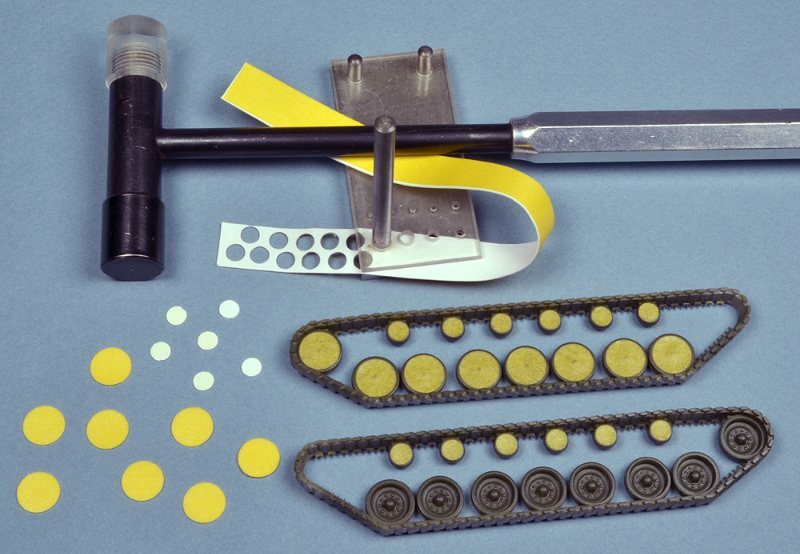 Punch-and-die setup for making round masks of Tamiya masking tape for wheels of AFV model. Self-adhesive labels (by Avery, for example) come on an easy-release backing sheet, from which the labels are, surprisingly enough, easy to remove. After I peeled off all of the label material, I cut a strip of the remaining backing paper and then applied a matching strip of Tamiya masking tape to the easy-release side, so that the resulting Tamiya masks were also easy to remove. I then applied a matching strip of 3M two-sided sticky tape to the back of the backing paper, and to the remaining side of sticky tape I added a matching strip of white Xerox paper. 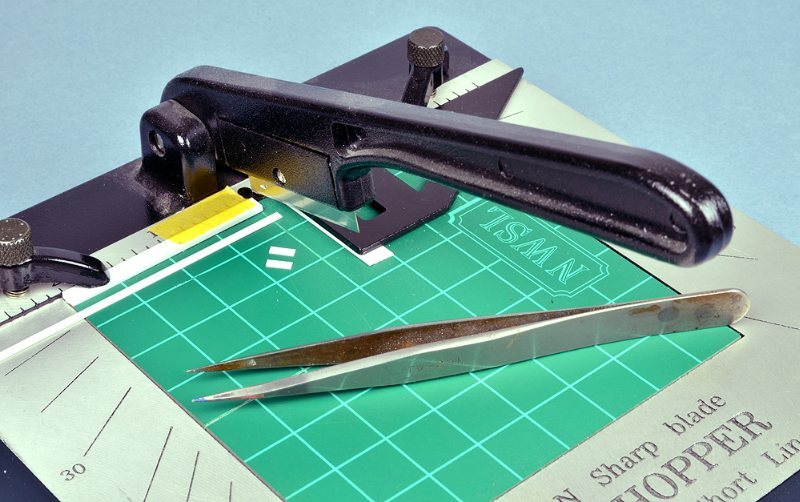 This whole sandwich assembly was placed in a steel punch-and-die set, Tamiya masking tape side down, and punched through the die with a quick, sharp tap of the hobby hammer. Tamiya masking tape disks applied to green-painted wheels, prior to airbrushing the rubber color on the tires and tracks. Experience has taught me that the punch-and-die set needs a little bit of thickness to punch through, to make a crisp, clean mask. Punching through just the Tamiya tape and backing paper often results in a stretched, distorted mask with rough edges, but the thickness of a little laminated assembly of masking tape, backing paper, double-sided tape and plain paper usually makes for a crisp, round masking disk, suitable for achieving a sharp-edged border during painting. Tracks painted and masks removed. Once all the disk masks were in place, I air-brushed the tires and tracks with Humbrol No.67 Panzer Grey, to simulate the rubber color. The disk masks protected the painted steel wheels, leaving a crisp border between paints. A fresh No. 11 X-Acto knife blade was used to carefully spear and remove each mask. After finishing and photographing the Trumpeter/Revell of Germany/TigerModel M1A1, something didn't look right. 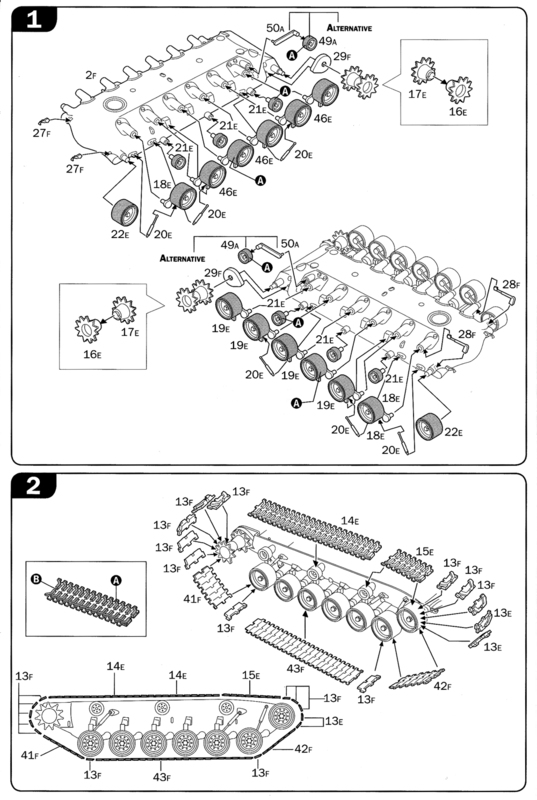 I had tried to carefully compare all of my many available M1 kit parts to a 1/72 scale drawing of the M1A1 from R.C. Hunnicutt's book on the Abrams, which led to my choosing the Trumpeter hull and turret, the Revell wheels and tracks and certain TigerModel turret details to build my M1A1 from Operation Desert Storm. As I built the model, repeatedly comparing it by eye with the drawings and photos, all looked OK. But once I uploaded the model photos to this website, the head-on view photo looked off. The completed model as seen in a photograph looked different than as seen by eye. To me the front of the Trumpeter turret looks a little too short in height. The gap between the bottom of the turret and the top of the hull looks a little too tall. See for yourself in the images above. Once I had spotted this apparent discrepancy, the damage was done. I know my nature: I will never look at this model again without immediately focusing on this major flaw. No amount of time will fade this disappointment; I know from my adventures with light bulb color warmth and model paint. You may very rightly be thinking "Please get a life! ", but I started to consider if it was possible to somehow fix this model. The risk with altering a finished model is that it is very challenging to hack and chop and glue and sand and repaint and touch up a delicate plastic model successfully. Pieces get broken, fly off out of sight, get lost. New touch up paint sometimes never matches the old paint already on the model. But I knew this M1A1 model would never be satisfactory to me, as is. I decided I may as well risk ruining it trying to fix it. All my finished models contain flaws that I can never not see, but usually they are minor enough that I can live with them, and with enough time, I tend to forget some of whatever was so unsatisfactory. But this model was too off. As a fall back position I reasoned that if I ruined the turret, I could build a new Trumpeter turret, with corrections, and put it on the otherwise perfectly acceptable hull. I might even be able to salvage some of the flawed turret's trickier pieces: the main gun barrel and the rear turret rack. So, with nervous fingers shaking a little, I began the surgery. Here's the turret with the towing cables removed and strips of Evergreen styrene plastic superglued to the underside of the front of the turret, to increase the vertical proportion of the turret. Here's the turret with the new Evergreen strips sanded down flush with the faces of the turret. The sanding has gone down through the sand colored paint to the original Trumpeter grey plastic. Avoiding damaging the HUSTLER decals was challenging. During this step, the .50 calibre machine gun got broken off, and the nylon house-paint brush bristle antennae got so bent that I pulled them out. The Testor's enamel custom mix has been oh-so-carefully airbrushed, paint thinned more than usual and applied at lower pressure than usual, to cover up all of the raw plastic. Once the touch up paint was dry, I added streaks of the slightly darker paint wash to the new paint, to match the variety of shades applied originally. This image also shows the towing cables and .50 calibre machine gun re-installed, and the Future Acrylic Floor Finish overcoat applied, again to match the painting steps already applied to the model. A challenge with painting multi-color camouflage on small scale armor is how to apply the paint neatly, accurately and cleanly. If you airbrush free hand, you can get a thin, clean finish that doesn't obscure detail under thick layers of paint, but it is very difficult to get a scale, sharp edge to the borders between colors, not to mention an accurate pattern. If you apply the paint free hand with a paint brush, you can get an accurate pattern that is neatly applied, but it is hard to avoid too thick coats of paint that drown out the fine details. 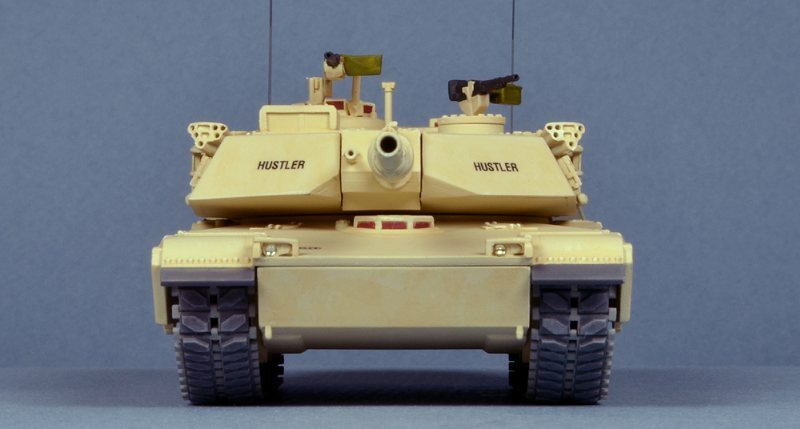 Ideally, masking the tank and applying the camouflage paint with an airbrush is best, but even when using Tamiya masking tape, it is hard to fully mask the complex surfaces of the AFV. 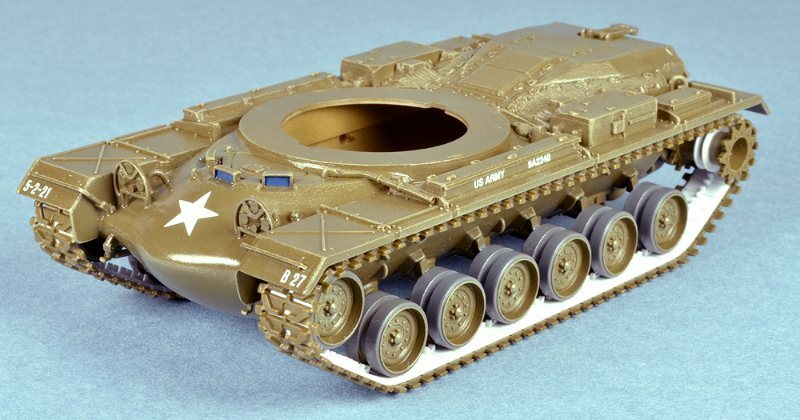 Years ago, in a hobby magazine, I read about using a product called "poster putty" to mask a tank model. Poster putty is a product intended to afix a paper poster to a painted wall in a room. The putty is sticky enough to adhere without leaving adhesive residue on the model, and flexible enough to conform tightly to complex surfaces. A few years ago, I tried this technique with good results, technically, but bad results artistically. Dragon Jagdpanther painted by the poster putty method. 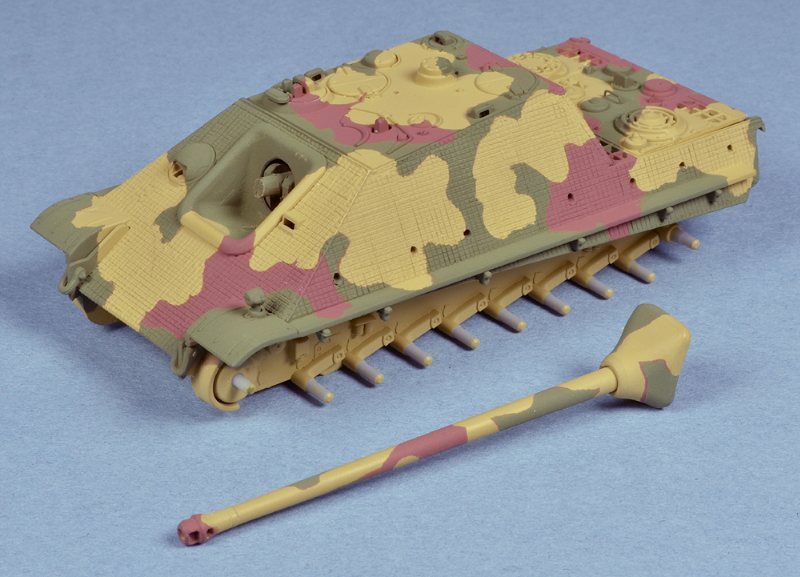 The artistic failure on this Jagdpanther paint job is that the Dunkelgelb (dark yellow) should have gone onto the model first (as on the real German AFVs of World War II) and then received the Olivgrun (olive green) and Rotbraun (red brown) on top, instead of being the last color applied. If you study the paint pattern on the model, you can probably see this backwards sequence. Live and learn, Version 4.63. Having completed one Abrams M1A1 model is a desert tan scheme, and a second Abrams M1 model in an overall green scheme, I wanted to paint a third Abrams M1A2 model in some different scheme. A Tankograd booklet on the Abrams SEP tank illustrated Abrams tanks in the current NATO three color camouflage, so I decided to give that a try. To make my learning curve mistakes on something other than the completed M1A2 model, I decided to use a spare Trumpeter Abrams upper hull. The pictures below depict that practice project; click on the thumbnails to see larger images. During a pre-test of the poster putty masking, I learned the putty stuck VERY well to the bare Humbrol paint. So, as I painted this test project, I applied clear acrylic over each paint step, to enable the poster putty to be easier to remove from the model. The clear acrylic worked well to release the putty, but I learned that the acrylic would collect into a fillet, up under the edge of the putty mask in a way that the Humbrol paint did not, leaving a thick ridge between colors, so I'll leave the clear acrylic off of the M1A2 model, until after the last color is applied. Another discovery was that the Humbrol No.119 (brown paint) was the wrong choice: too much contrast with the green and black. The brown color needed to be much closer in tone (amount of black in the hue) to the Humbrol No.102 and the Humbrol No.67 of the NATO camouflage. After successfully trying a different brown paint on the pre-test sample, I will use Humbrol No.186 on the model. ModelCollect kit parts representing open gratings as solid plastic, replaced with TICHY brand HO railroad engine plastic gratings. Plastic model engineers have to make many conflicting decisions about the plastic models they design. Accuracy of the subject, buildability of the kit, ease of manufacture and a profitable budget all have to be in balance, for a plastic model assembly kit to be successful. Compromises in all of these areas are required. 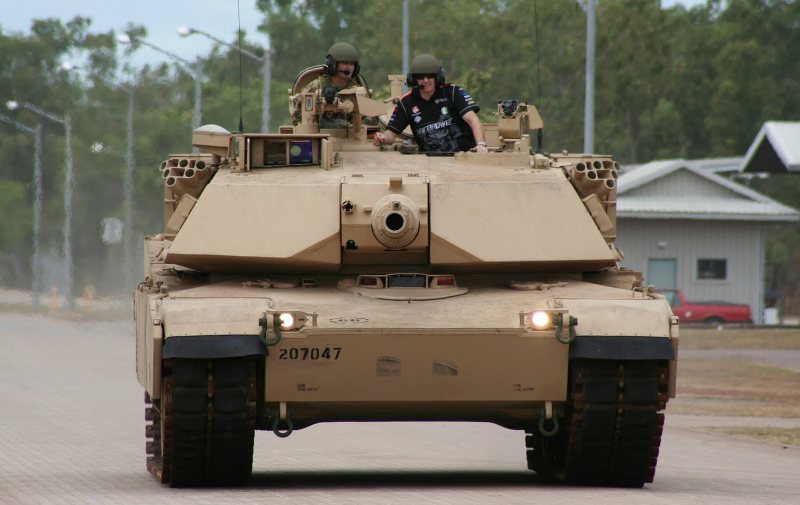 Gratings are one of the aspects of full size AFV prototypes that invariably have to be represented in a major compromise on plastic kits, particularly in the smaller scales. Where the prototype has open mesh walkways or platforms that are manufactured out of welded steel strips, bars, rods or screening, on a 1/72 scale model this is usually a level of detail that is not practical to depict economically. The ModelCollect kit of the Pershing missile transporter/erector shown above illustrates this truth. 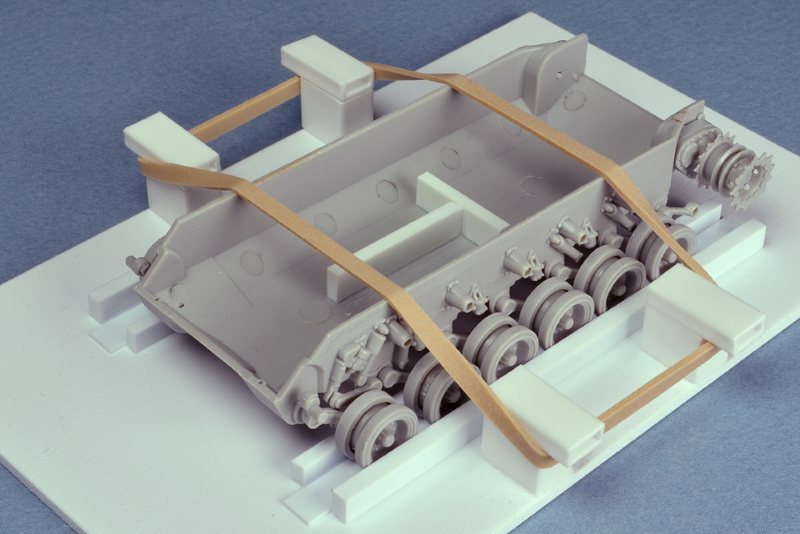 On the ModelCollect kit, the crew platforms are rendered as solid flat surfaces, with a little raised detail, very shallow in depth, to suggest the open latticework on the real machine. One of the fun and interesting challenges of improving on kits like this is to substitute other materials to more accurately represent these gratings. 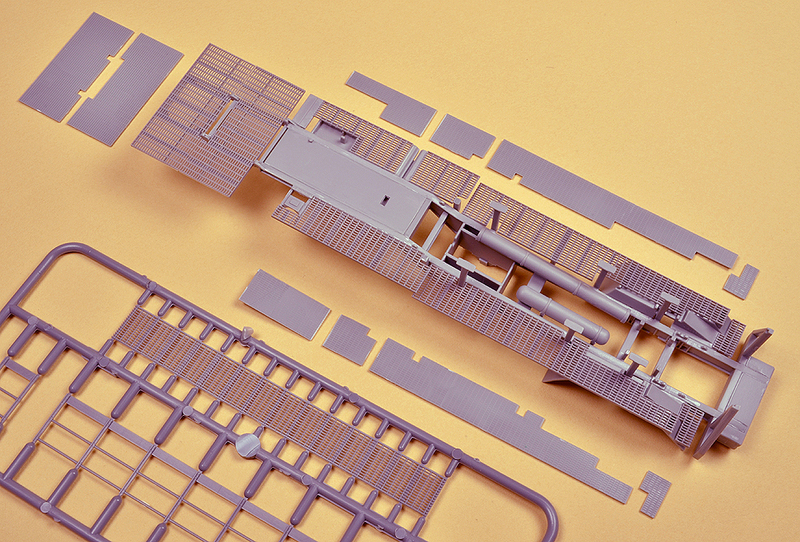 In the picture above, the small, flat pieces resting on the tan background are the remnants of the ModelCollect kit platforms that I replaced with an after-market detailing product manufactured by TICHY, an HO train model company. 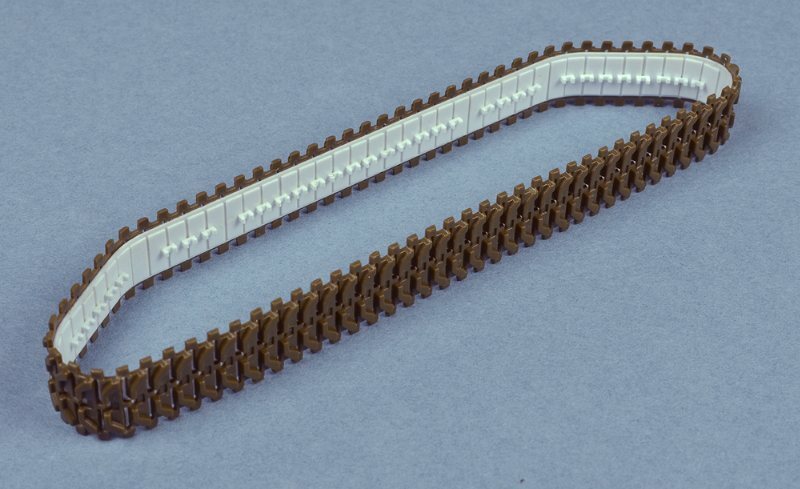 These moldings were intended to be added to HO scale diesel locomotives. An example of the unaltered TICHY grating is visible in the lower third of the picture above, still on the sprue. The platforms attached to the ModelCollect Pershing transporter/erector are TICHY gratings cut to fit in place of the ModelCollect kit pieces. Note the much more realistic appearance of these TICHY open gratings, compared to the solid ModelCollect parts. This effect will be even more pronounced, once an opaque layer of paint has been applied. It is a lot of work to do this, but I think it is well worth it. I had to accept compromises of my own here, since the spacing of the slats on the TICHY material is much more coarse than the actual grating on the prototype. You do what you can with what is available.